After showing the “master key” and “FakeID” vulnerabilities in Android’s signature verification, today we demonstrate a new vulnerability. This was first discovered by Alibaba’s security team and disclosed at BlackHat Mobile Security Summit 2015. 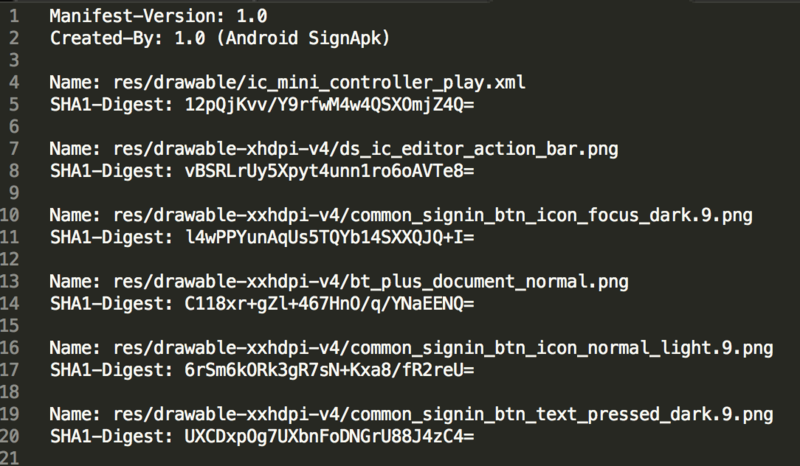 In this article we will highlight one of the major vulnerabilities in Android signature verification, and demonstrate a new way to exploit this vulnerability- “To kill with a borrowed sword.” Namely, getting AntiVirus software to remove an innocent target app. Android is decentralized not only in its system, but also in its app distribution. To ensure an app’s integrity and traceability, Android enforces that all apps must be signed by the developer’s’ private key. 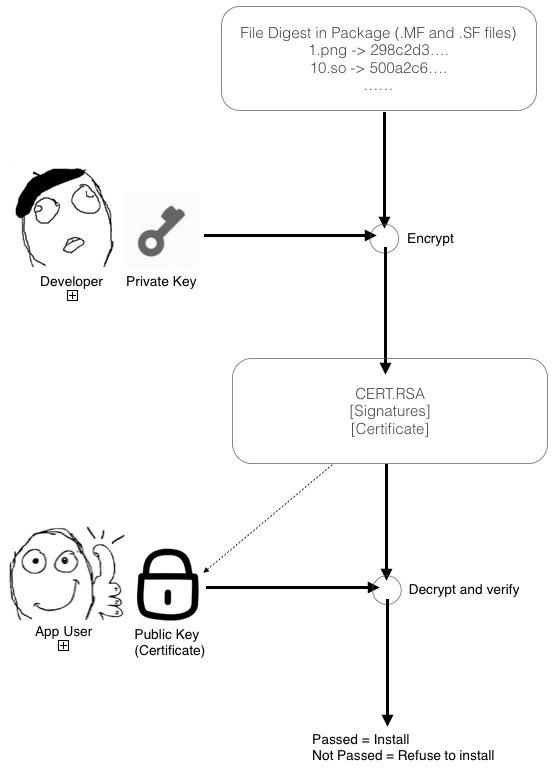 After being signed, an app will be linked to the developer with that developer’s public key (or certificate). Thus, any changes in the package will result in signature verification failure and rejection upon installation. 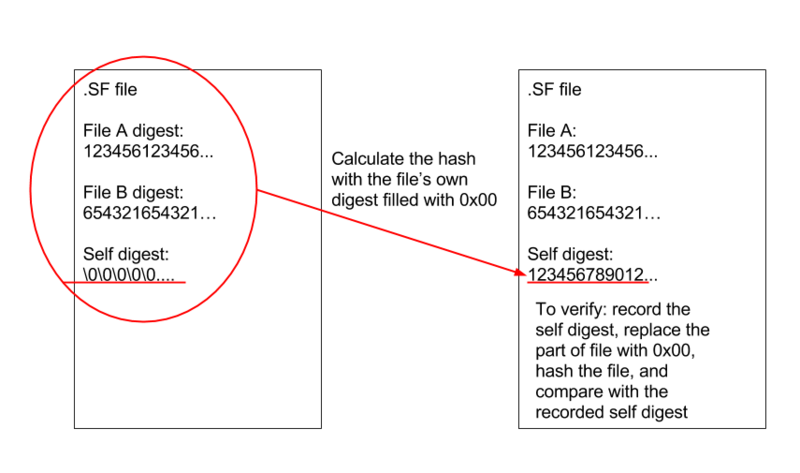 The signature verification process is shown in the figure above. Each file in the package will generate a digest using the SHA-1 hash function. Afterwards, they will be encrypted by the developer’s private key and put into the certificate file (ended with .RSA or .DSA depending on the public key algorithm). Without the developer’s private key, nobody could forge or modify any file. SHA1 digests for the files in CERT.SF file in the META-INFO folder. There is a loophole in the Android’s signature mechanism: any file containing the APK file’s digest can not also be included in the file digest list. This is obvious: it’s difficult to generate a file containing its own SHA-1 hash. In other words, finding a hash(AB) = A is undoable. So the digest summary file, CERT.SF, cannot contain its own SHA1 digest. Any file ending with .SF, .DSA, .RSA or .EC, and those in the META-INFO folder, will be ignored when verifying the signature. That gives attackers a chance to put arbitrary files into the package without breaking the signature verification. 1. Prepare a malware file (e.g. the EICAR malware test file which can be identified by most AntiVirus vendors), and the APK you would like the AVs to remove. 2. Unzip the APK, put the malware file into the META-INFO folder, and zip it back. Due to the vulnerability, you now have a APK file which contains malware components, yet one that can still be identified as legit by the certificate verification. Even when the version of the repackaged APK is the same as the original APK, the repackaged one can still replace the original one. 4. Additional Attack: If the repacked APK is uploaded to Android app vendors, it will be identified as written by the original developer instead of repackaged by an attacker. If the designated Android market scans viruses before publishing, the original developer might be put in trouble because the repackaged app signed by their certificate contains malware (namely, the EICAR malware testing file). Through this approach, no file would be ignored: every file would be verified against the digest list. Any new file additions would cause an authentication error.